Quote: In a 2003 online interview, MercyMe lead singer Bart Millard recalled one of the first times he told a mainstream radio deejay, live on the air, the heart of the “I Can Only Imagine” story. He said, “I think we all have to believe that there’s somebody in control of all this mess. For me, it just so happens that somebody is Christ... It’s because He’s the only person that has ever changed my life.” Indeed, that conviction resonates throughout each of the songs on this 2-disc collection. 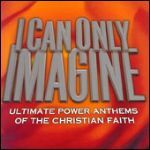 FYI: These ultimate power anthems represent a vast 25 years of Christian music, from the 1977 Don Francisco classic, “He’s Alive,” to MercyMe’s “I Can Only Imagine,” which began its journey to unprecedented national crossover success in 2002. The Bottom Line: From The Imperials (“Praise the Lord”), Michael W. Smith (“Great is The Lord”), and Michael English (“In Christ Alone”) to Amy Grant (“El Shaddai”), Rich Mullins (“Awesome God”) and Phillips, Craig & Dean (“Crucified with Christ”), combined here are 22 belief-centering, life-affirming, heaven-certain musical highlights that will inspire with every listen. A wish-list of favorite songs to be compiled on one release is bound to change from person to person, but I Can Only Imagine: Ultimate Power Anthems of the Christian Faith really does an exceptional job of bringing together many defining worship music moments from the past quarter century. Featuring: “Basics of Life” (4Him), “Butterfly Kisses” (Bob Carlisle), “God Is in Control” (Twila Paris), “The Word” (Sara Groves), “Rise Again” (Dallas Holm & Praise), “Shout to The Lord” (Darlene Zschech), and many more favorite hits.